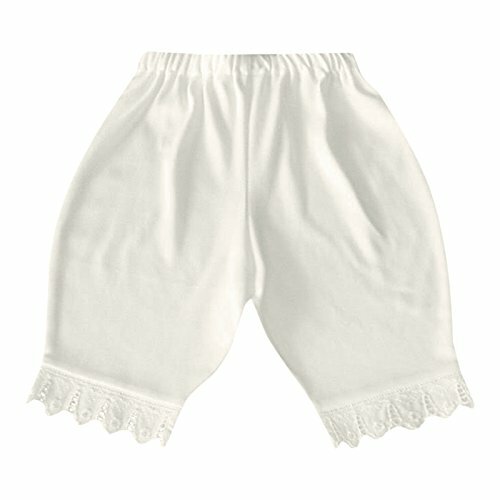 Toddler Bloomers by Victorian Organics are soft, vintage style bottoms, inspired by the Victorian era. Lace trimmed below the knee length pants are easy, comfy, and a great heirloom-style gift. Bloomers are traditionally worn under dresses, and are also called petti-pants. Ariadne designs new children's clothes made of organic cotton knit with 100% cotton eyelet lace trim that will make everyday special, and special occasions a natural occurrence. Bloomer pants are just the fashion for holidays, birthdays, theater costumes, fairy tale play, charming keepsake photos, and family portraits. It's helpful to use a lingerie bag when machine washing to keep the garment looking new. To dry the garment you may choose to hang it on a hanger or lay it flat, and finger press the wet lace to smooth the wrinkles out. If using a machine clothes dryer it is recommended to dry the garment with low heat and press the lace with a hot iron. Many people who prefer hot machine laundering for children, don't mind the natural look of the wrinkled lace after throwing the garment into the dryer, but the garment will look like new If the lace is pressed. Minimal shrinkage.